In 1990 I bought a set of 3/4" scale "Raritan" castings from its designer, Mr. Morewood in New Jersey. I machined the tender truck frames and the tender wheels in 1990, and various other parts of the locomotive or tender at various times in the 1990s and 2000s, but the project often spent months and years with no work being done on it. I have recently (2013) commenced to FINISH the locomotive with no further delay. Photographs will be posted as the project progresses. Photos that I had taken in prior years as work was completed (back then), will be posted as time allows. The cylinder machining was started. Raritan cylinder in the Myford lathe being drilled 1/2". Click to enlarge. The 1/2" hole, complete. Click to enlarge. Cylinder being drilled 3/4". Click to enlarge. The 3/4" hole, complete. Click to enlarge. 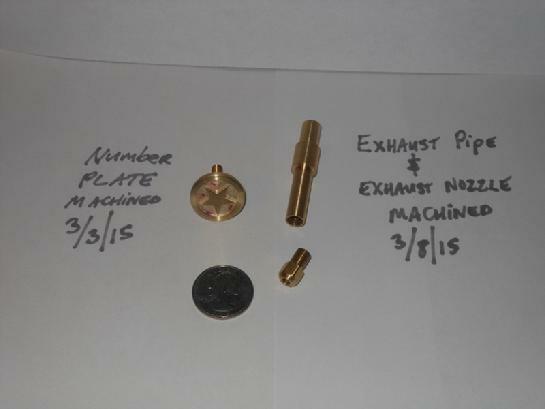 The Exhaust Tee was machined on March 31st, 2015. Click the photo to enlarge. The recess in the frames for the Exhaust Tee, was machined. The Raritan frames in the JET mill-drill, for machining of the openings for the Exhaust Tee. Click the photo to enlarge. A closer view of the machining. Click the photo to enlarge. The Exhaust Tee slot being finished with an endmill. Click the photo to enlarge. The Exhaust Pipe, and Exhaust Nozzle, were completed. Material: brass stock. A 7" Myford lathe, dial calipers, 6" scale, and 1/4-28 tap and die, were used. On March 3rd, the front Number Plate was completed. A star was silver-soldered on, in lieu of a numeral. Material: brass. The 7" Myford lathe, a hacksaw, a jewelers' saw, a JET mill-drill (to get the star arms as accurate as possible), a file, sandpaper, 3M "scotchbrite" pad, and silver solder, were used. The front "number plate", and the exhaust pipe and exhaust nozzle, were machined in March 2015. The "D" valves were completed. Material: cast iron casting from Mr. Morewood at Morewood Models. Blue layout dye, height gauge with scriber, surface plate, & mill-drill machine were used. 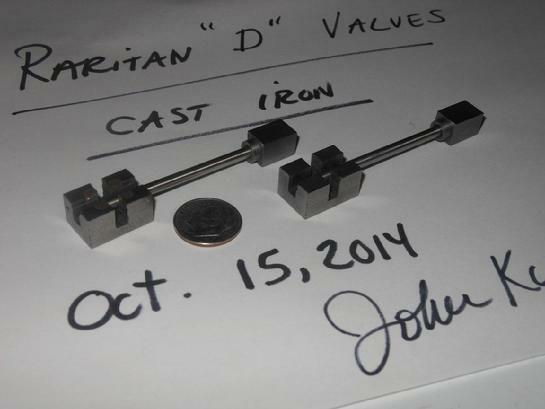 The "D" valves for the Raritan were completed on 10-15-14. They are shown here with the valve rods which had been machined prior. The "D" valves were machined from the cast iron "valve" casting supplied by Mr. Morewood. In the photo below is one of the castings as received from Morewood Models, and the 2 valves that were machined from an identical casting. This is as far as I got today. Tomorrow, the recess underneath the valve will be milled out, and the cross slots on top of the valve (for the valve rod and the valve nut) will be machined. The rough "valve" casting as supplied by Mr. Morewood, and the 2 valve pieces machined from an identical casting. Tools/machines used: hacksaw, mill-drill machine, vernier height gage with scriber, 12" x 12" surface plate, blue layout dye. The valve rods, part #1-2, were started. 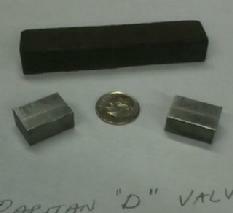 5/16" square steel was chucked in a 5/16" square 3C collet in the Derbyshire toolmakers' lathe. It was faced to length, the round boss was turned, and it was center drilled and then drilled straight through (axially) to a diameter of 1/8th inch (.125") for its entire length, for the valve rod. The valve rod is 1/8th inch stainless steel, faced to length and turned down to .112" on one end for a distance of 1/2" (.500") for the #4-40 thread for the valve nut. The valve road will be threaded, silver soldered to the block, and then the block finished with a cross hole, a slot, and a raduised end. Part #1-2; valve stem. Click the photo to enlarge. Part #1-2, the valve stem, view 2. Click the photo to enlarge. Machining the "arched" piece of the tender truck equalizer assembly. Material: 2-1/2" diameter brass bar, bored out to the correct size. The drawings call for steel to be used but I had an old piece of brass bar on hand, leftover from when I had machined some clock barrels, that was suitable. Tools/machines used: 10K South Bend lathe (my 1st lathe); Myford Super 7 lathe, turning and facing toolbit, center drill, assorted drills up to 3/4", boring bar, parting tool. On my South Bend 10K the piece was faced, drilled axially up to a 3/4" diameter hole (the largest drill I own), and bored the remainder up to size. It was then parted off. It was faced to the correct thickness in a Myford Super 7 lathe, and deburred. Boring 2-1/2" diameter brass. Click the photo to enlarge. Parting off the "ring" that will be the "arch" on the Raritan tender trucks. Click the photo to enlarge. 4 of the 8 required tender truck "equalizer bars" were cut from 1/16" steel. Click on the photos to enlarge. Tools/machinery used for the equalizer bars: 6" scale, pencil, paper, blue layout dye, scriber, vice, drill press, center drill, drill, jewelers' saw, files, mill/drill machine. Equalizer template. Click the photo to enlarge. Equalizer bars rough-drilled. Click the photo to enlarge. Equalizer bars rough sawed. Click the photo to enlarge. Finished bars. Click the photo to enlarge. Fitting the arched "ring" to the bars. Click the photo to enlarge. Arched ring fitted. Click the photo to enlarge.